CMM-Manager is a task-based, highly intuitive measurement software package for your CMMs. It is a fully integrated environment supporting walk-in quick-measure, one-click CAD-measure, collision-free CAD-teach, virtual simulation, real-time verification, advanced path planning, CAD alignment and Datum alignment. 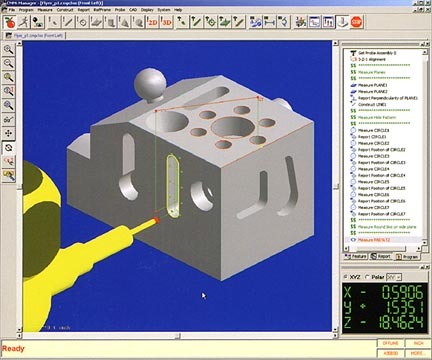 CMM-Manager also offers you flexible yet easy-to-use functionalities, including graphical probe configuration management, automatic tip calibration, cross section scanning and hole pattern measurement. …offers clear and simple user interface design and enable the operator to quickly measure complicated features, such as hole patterns, in minutes. 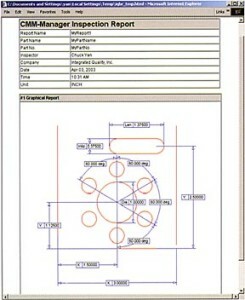 …provides intuitive and easy-to-use graphical dimensioning tools. 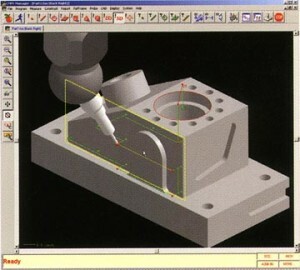 The operator can quickly snap measuring features on the screen to display dimensions including distance, angle, and size. …allows the operator to quickly create a web-ready HTML report which can be emailed to customer or published on company intranet for information exchange and sharing. …offers true CLick-n-Measure capability. The operator picks the feature on the screen. 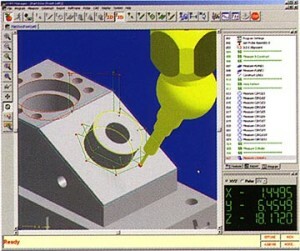 CMM-Manager will automatically select the proper probing angle and generate collision-free path. 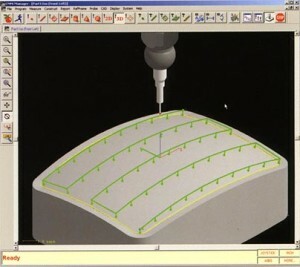 The operator then simply clicks the Measure button to confirm the selection, and the CMM will measure the feature rapidly. 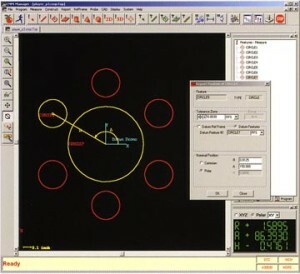 The allows the operator to concentrate on what feature to measure and report instead of what angle to use or whether probe collision will occur. …organizes part program using clear, easy-to-understand icon representation. Each icon represents a Measure,a Construct or a Report task. This task-oriented design eliminates the headache of dealing with lengthy text based part program. 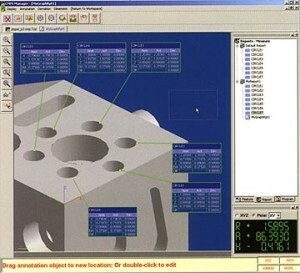 …provides comprehensive graphical programming tools for the operator to easily create inspection part program directly from CAD model, to easily modify and edit part program, to visually simulate and verify part program. …highlights reporting and datum features for easy feature identification, and illustrates reporting dimensions and tolerances in the graphics window for easy visual confirmation. …provides drag-n-drop function for easy graphical report creation. The operator can simply drag a report item from the report database tree and drop it to the graphics report window, a graphics report table is created instantly. 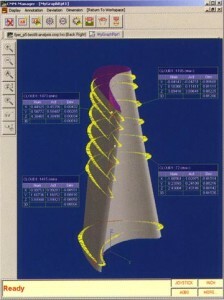 …allows the operator to easily define a cutting plane for cross section scanning or to pick a free form surface for digitization. …automatically selects the best probing angle to measure features. 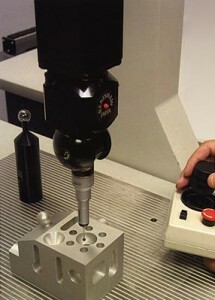 When necessary, CMM-Manager will select multiple probing angles in order to inspect difficult-to-measure features such as deep pockets and through holes. …intelligently modifies probe moving path to avoid any obstacles along the path once a probe collision is detected. As this is done automatically, it smartly generates completely collision-free inspection path. …provide powerful datum alignment tool which aligns a part to designated datum points. The soft fixturing function eliminates the need of dedicated hard fixtures and helps customers to reduce high cost in hard fixture fabrication and maintenance. 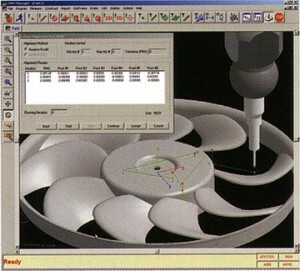 …has a built-in best-fit analysis engine that can be used to compare measurement data with CAD model. The powerful best-fit function eliminates the influence of misalignment and cosine error in tolerance evaluation thus helps the user to achieve the best possible inspection accuracy.